For the Christmas carol of the same name, see In the Bleak Midwinter. For the mystery novel of the same name, see In the Bleak Midwinter (novel). 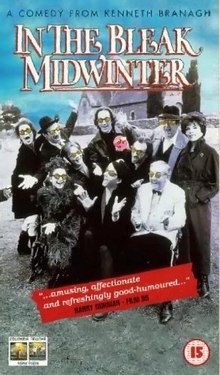 In the Bleak Midwinter (released in the US as A Midwinter's Tale) is a 1995 British romantic comedy written and directed by Kenneth Branagh. Many of the roles in the film were written for specific actors. This was the first film directed by Branagh in which he did not appear. The film begins with a monologue by out-of-work actor Joe Harper (Michael Maloney) about his slow decline into depression. In an attempt to beat his depression, Joe volunteers to help try to save his sister's local church from land developers for the community by putting on a Christmas production of Hamlet, somewhat against the advice of his agent Margaretta (Joan Collins). As the cast he assembles are still available even at Christmas and are prepared to do it on a 'profit sharing' basis (that is, they may not get paid anything), he cannot expect – and does not get – the cream of the cream. But although they all bring their own problems and foibles along, something bigger starts to emerge in the perhaps aptly named village of Hope. This film encapsulates the hilarious and heartbreaking struggle of actor versus situation versus life, and often versus each other. It was shot in black and white for artistic effect. Ophelia: Nina Raymond, a shortsighted well-meaning space cadet who has been using low-calorie mayonnaise for lotion because she can't make out the label. King Claudius: Henry Wakefield, a long-suffering and cynical old Englishman with a sharp tongue and a list of prejudices five miles (8 km) long, forced to room with Queen Gertrude's player. Queen Gertrude: Terry DuBois, a flamboyantly gay theatrical actor with an estranged son and a preoccupation with costume. Laertes, Fortinbras, and various roles: Tom Newman, a vain, self-righteous method actor who foists his values on everyone else and attempts to distinguish his many characters with a variety of outrageous accents. Horatio, Bernardo: Not-so-subtle Carnforth Greville, an alcoholic in denial and a kindly bachelor with no memory for lines whatsoever. Polonius, Marcellus, and the First Gravedigger: Vernon Spatch, the ambitious techie's techie, self-imposed marketing director, and unofficial documentarian of the proceedings. Set Designer: Fadge, just Fadge, specialising in new-age art and obscure statements about "air", "space", and "fog". Close friends call her "Fa". The film was well received by the majority of critics and currently holds an 81% "Fresh" rating on Rotten Tomatoes. Roger Ebert, noted critic of the Chicago Sun-Times, gave the film three out of four stars, praising the performances and Branagh's screenplay. Online critic James Berardinelli highly praised the film, giving it three-and-a-half out of four stars, stating, "No current film maker appears to love and understand Shakespeare as well as Branagh, and never has his affection for the Bard been more apparent than here. This picture succeeds as a comedy, a satire, and even, to a certain extent, as a mild melodrama about choosing between a paycheck and the nourishment of the soul." Berardinelli concluded, "Anyone who wondered about Branagh's future following Frankenstein can set their concerns to rest. He's back on top in the independent arena with A Midwinter's Tale, a film that offers ninety-eight minutes of pure fun re-interpreting the phrase 'the play's the thing'." ^ "A Midwinter's Tale". Rotten Tomatoes. Retrieved 20 January 2012. ^ Ebert, Roger (23 February 1996). "A Midwinter's Tale". Chicago Sun-Times. Retrieved 20 January 2012. ^ Berardinelli, James. "A Midwinter's Tale". ReelViews. Retrieved 19 January 2012. This page was last edited on 28 May 2018, at 08:00 (UTC).